Orchestral Disorder, Other CD & Sound Bank from 9 Soundware. 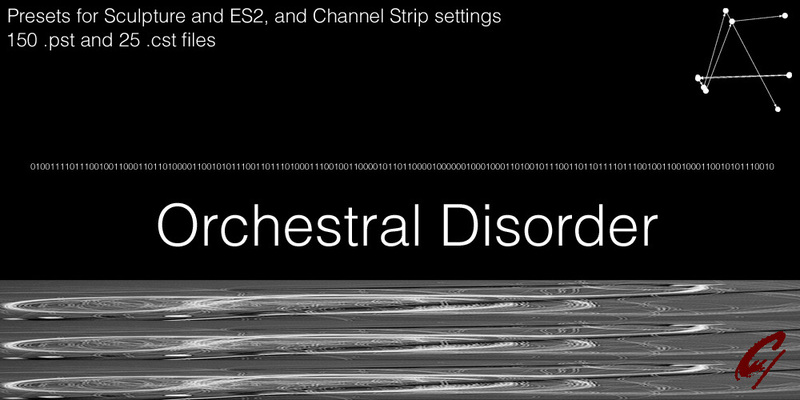 Orchestral Disorder is a collection of presets for Apple Logic Pro inspired by orchestras. The concept behind the sound set was not to closely emulate acoustic instruments, but rather to explore the possibilities of orchestral timbres without human limitations or purist biases, the company says. Featuring three main components, the multi-format product includes files for the Sculpture and ES2 synthesizers, as well as Channel Strips. The Sculpture component of the sound set comprises of 100 files. Categories include “Violin”, “Cello”, “Double Bass”, “Timpani”, and “Noise”, each of which consists of 20 files. The string instrument categories are further divided into subcategories “Arco” and “Pizzicato”. The ES2 component of the sound set comprises of 50 files. Categories include “Choir”, “Organ”, “Theremin”, and “Turntable”, each of which consists of 10 files, with the exception to “Choir”, which contains 20 files. The “Choir” category is further divided into subcategories “Female” and “Male”. The “Turntable” files are noise instruments inspired by scratching. These presets echo sonic and interactive attributes of vinyl scratching with the advantages of MIDI control. Included in the form of Channel Strip settings are 25 ambiences and textural modifiers built from Logic Pro plug-ins, which were designed to extend the sonic range of the Sculpture and ES2 presets of Orchestral Disorder. These files employ extreme settings and atypical routing of effects to alter the source audio. The Channel Strip component is made up of two categories, “Ambience” and “Distortion”. The “Ambience” category is further divided into subcategories “Non-rhythmic” and “Rhythmic”, both of which consist of 10 files. The “Distortion” category contains 5 files. 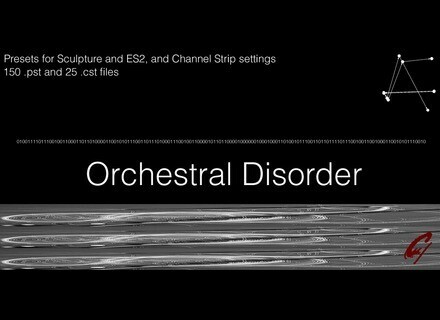 Orchestral Disorder is a modular product. In addition to the full version of the product which includes all three components, the Sculpture and ES2 components are available as partial downloads. The Channel Strip files are exclusive to the complete edition. The 2 MB download includes 150 .pst files and 25 .cst files. Orchestral Disorder is available now for $39.99 at www.9soundware.com. The partial downloads for the Sculpture and ES2 components are available for $24.99 and $14.99 respectively. Abeem Rack Performer v0.96-alpha. Abeem Live Technologies has updated Rack Performer to version 0.96-alpha. IK Multimedia AmpliTube Fender App IK Multimedia announces that AmpliTube Fender apps for iPhone, iPod touch and iPad are now available for download from the iTunes App Store. Sample Magic SM21 Tech-House Merging house, techno, progressive and minimal, Tech-House features 560MB of samples presented in 24-bit.